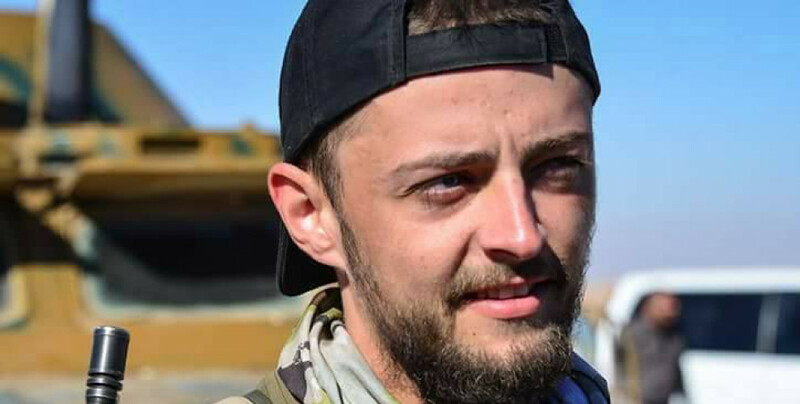 The BBC reported that British YPG fighter Jac Holmes has fallen while clearing landmines in Raqqa. Jac Holmes, 24 from Bournemouth, who has been fighting in the ranks of the YPG since 2015, has lost his life while clearing landmines in Raqqa, the BBC reported. His mother, Angie Blannin, said the 24-year-old had been a "hero in my eyes". She told the BBC: "He loved what he was doing there, he loved being a soldier. He had the courage of his convictions. "He was just a boy when he left the UK, a little bit lost. He told me he didn't know what he wanted to do with his life. But by going out there, he found something that he was good at and that he loved." "He stuck by his convictions because he wanted to be there and he wanted to see the end of Raqqa and to see the end of the caliphate. That was a moment in history, and he wanted to be part of it." "We thought with any luck he'd be home for Christmas. It had been so tough since he had been away but I was always 100% behind him." "After all this, he had said he might go into politics, or perhaps into close protection security. He'd seen so much for a boy of his age." He said: "Everybody knew Jac. By his third tour out there his Kurdish was fluent. We had a bit of a laugh that he was my Kurdish translator. "He spoke so fondly about Rojava. He was the reason that made me want to go." "He loved being out there, he loved the people around him. He had a purpose and he was happy," said Mr Ozdil. In the "223 YPG Sniper Unit" Mr Holmes fought alongside three others from Spain, the US and Germany.